Hinton’s oak is a small, deciduous tree that grows up to 15m in height. It is found in sub-montane to montane dry forest in Mexico, has a dark bark and is characterized by bright red foliage in early spring. The species is only found in the south-east of Mexico between 1300 and 2000 m. A study by the Sir Harold Hillier Gardens and Arboretum, together with the University of Puebla, determined that the species covers just 46,000 hectares, distributed across three highly disturbed populations. Hinton’s oak is of great socio-economic importance and is part of the traditional culture of the Tejupilco people. It is used locally for tool handles, beams and fencing poles, but primarily for firewood. The wood is traditionally used to bake “las finas” bread, the characteristic taste of which is imparted by the smoke. This species is Endangered in the wild. 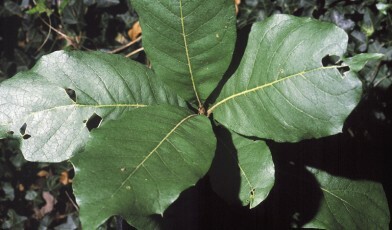 The population size of Q. hintonii has decreased dramatically as a result of habitat loss. The species now only occupies a small geographic area measuring 2,566 sq km. Agriculture (predominantly maize and fruit trees), coffee and avocado plantations and road construction have all contributed to its decline. The species has also been highly affected by grazing, which prevents regeneration. The Global Trees Campaign supported a project for Hinton’s Oak in 2000-2002. Conservation measures included increasing the involvement of local authorities and landowners, providing training on plant propagation, field research, and the development of an education campaign. Collaborative research between Mexican experts from the University of Puebla and staff from the Sir Harold Hillier Gardens and Arboretum in the UK led to the development of a conservation strategy for the species, which was presented to the Regional Education Co-ordinator, the presidents of municipalities and the authorities in charge of reforestation. In addition, an educational guide to the conservation of the species was produced and an agreement was reached to provide local training in oak propagation techniques.